Next week, NASA is scheduled to send human technology closer to a star than ever before. What they learn could change our understanding of, well, the whole galaxy. The Parker Solar Probe is a mission set to orbit the Sun at just 3.8 million miles. Compare that to Earth’s average distance of 93 million miles, or Mercury’s average distance of 36 million miles. 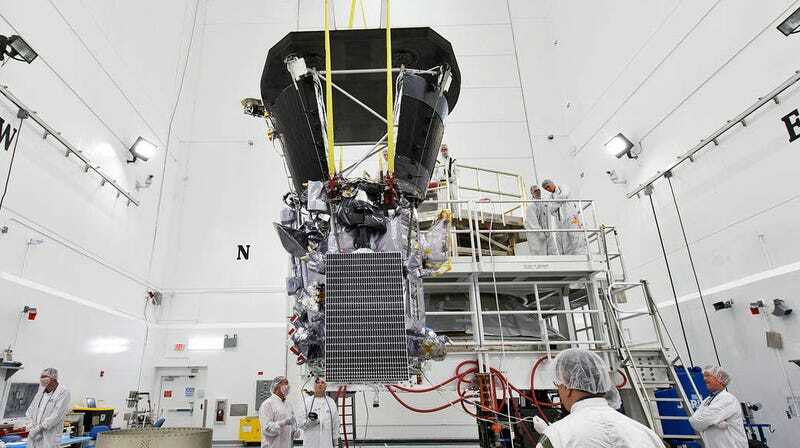 The spacecraft will need to shield itself from temperatures as high as 2,500 degrees Fahrenheit in order to find answers to the many questions scientists still have about our Sun and stars in general. The probe is at Cape Canaveral, loaded into a Delta IV heavy rocket. Following its August 11-at-the-earliest launch, it will hurtle towards the Solar System’s centre at speeds as fast as 430,000 miles per hour, according to a NASA fact sheet. It will pass our neighbouring planet Venus seven times for a gravitationally assisted slow down, studying our gassy neighbour along the way, before arriving at its final solar orbit. There are numerous mysteries that a mission like this one could solve. Perhaps most relevant to you is that the Sun releases blasts of high-energy particles that could be potentially catastrophic to our electric grid. Even Congress is worried about this. The probe will measure how the Sun generates these particles, which will hopefully help scientists forecast these events. It will also help scientists figure out why the Sun’s corona, the plasma surrounding the star, is so much hotter than the star itself. The probe won’t fly through the million-degree-Fahrenheit corona – these are temperatures wholly inhospitable to our technology. But it will skirt the outermost regions. And the probe may uncover solar phenomena that scientists haven’t even dreamed of yet. It’s the difference between looking at a star from close up versus far away – you’re sure to learn new things by getting closer. “The Grand Canyon looks cool from far away, but if you go up to the edge it looks like a completely different canyon,” said Garvin. The mission comes with extreme challenges that the project engineers have done their best to prepare for. An 8-foot-wide, 4.5-inch-thick carbon-composite shield protects the probe, keeping its instruments at a cozy 85 degrees Fahrenheit, according to NASA. The outside face of the shield is coated with white ceramic paint to further reflect heat away from the probe. The Sun is a wild beast, with million-degree tendrils spewing harmful radiation into space. It provides energy to life on Earth, but also has incredible destructive potential. And NASA is going to march right up it.